name that fruit! : surinam cherry 500.
spring has sprung on the isle, the flowers are in bloom, and the fruit is ripe on the trees--even on those that were previously thought to be barren. my parents have had this surinam cherry tree in their yard for years, i suppose a nod to their days in new jersey (in the heart of soprano-land, whee), and the giant cherry tree we had out back. however, i don't think this one ever fruited until now. 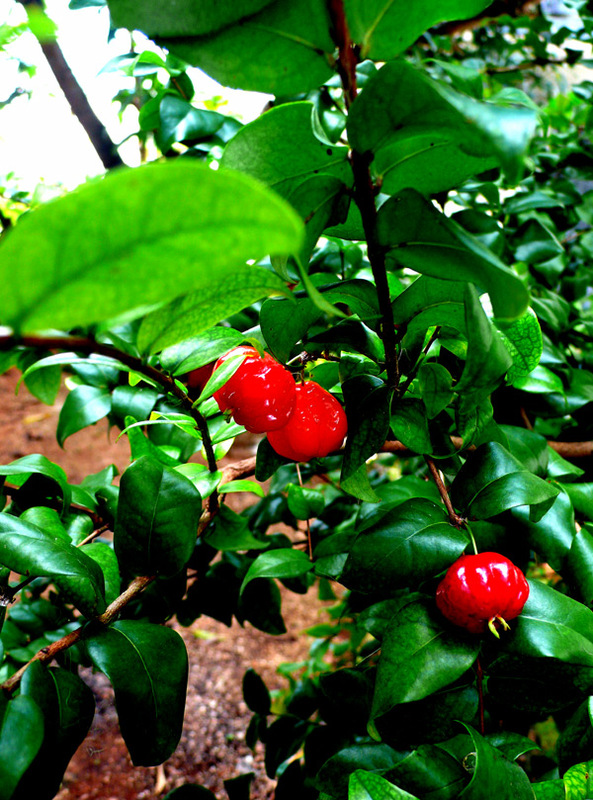 the surinam cherry--eugenia flora L. to her friends--was one of those many plants brought over to the islands by the portuguese explorers, most likely from goa, maybe by way of south america, as it is sometimes known as brazilian cherry. 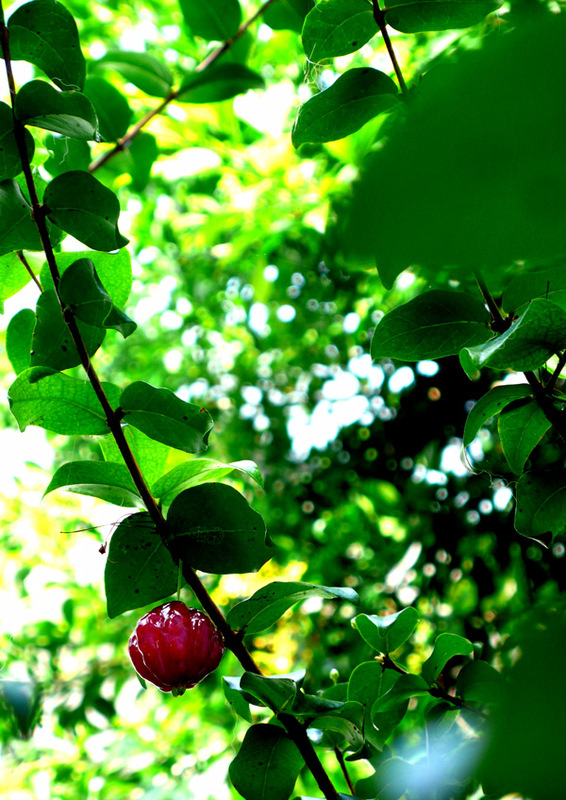 i believe the chamoru/local name for this is pitanga (although it's usually just called "cherry" pffft), but i can't seem to find the tagalog/filipino name for it, as it does not seem to be common in the philippines. certainly, it's not so common here that everyone knows what it is, but if someone had one in their backyard they remember the fruit, which is bright orangey red when young and a deep sanguine red when ripe, thin-skinned, and juicy, with a core of tiny resinous yellowish-white seeds in the middle when immature, which rather miraculously becomes a recognizable pit upon ripening. a very attractive fruit; surely if this was in the garden of eden, we might be in less trouble today. 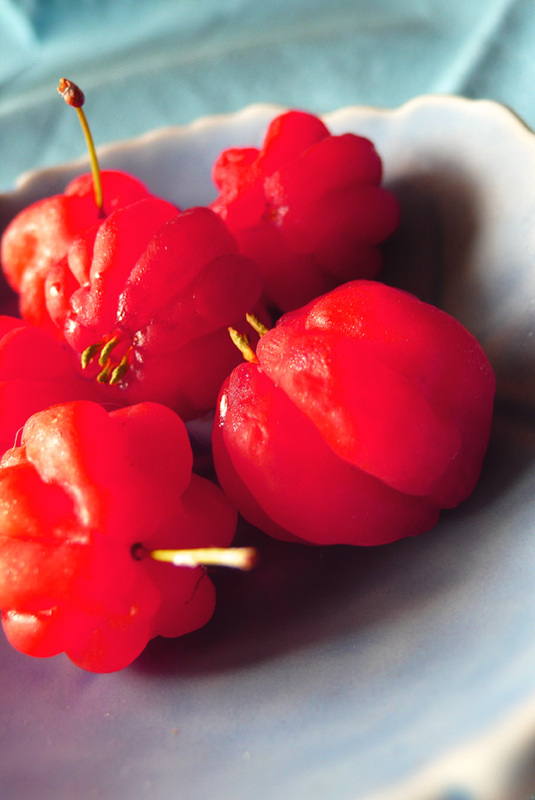 the flesh is similar to that of the more commonly known cherry, but the flavour is not; frankly, even after eating more than a handful of these, i'm not sure exactly what the flavour is. it it vaguely reminiscent of cherry, but only because its skin is a bit tart but the rest is mellow sweet. it almost tastes like a bell pepper to me, but with a different finish--not so much bitter and spicy, but tart and slightly tomatoey. the fruit is best left to ripen on the tree, when a mere touch will bring them down. supposedly a sprinkle of sugar will intensify the flavour, and make a good substitute for strawberries. my friend bill makes these into a brilliant jam, i'm told. i'll have to ask him for the recipe, once this tree comes to full fruition. 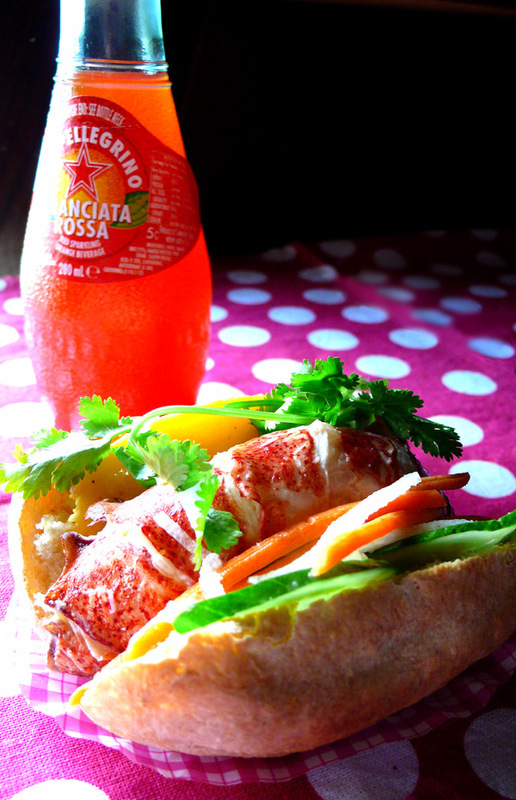 this particular one was inspired by one of chef mario batali's entrees in "iron chef america" mango battle: a homemade french roll was split in half, spread with a tiny bit of mayonnaise, and filled with sweet lobster meat, marinated julienned carrots and daikon, cucumber slices, cilantro, and a slice of grilled mango. chef batali also added thin slices of char siu pork, but i am currently abstaining from most meats, so i omitted it. the sweet, warm mango made a fine addition on its own. i don't really keep a house where leftover lobster might be found, but blow me down, there it is. shrimp or prawn meat are tasty and similar substitutes, but grilled chicken would work just as well. combine the water, vinegar and sugar in a saucepan and bring to a boil. leave to cool, then add the julienned vegetables and salt to taste. refrigerate for at least half an hour, but ideally overnight. 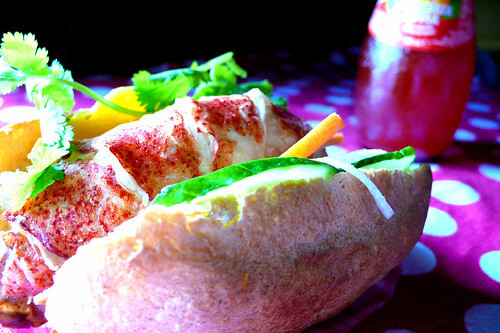 roll with it: from baguette to pandesal and back (eventually). it was maki who introduced me to that popular no-knead bread recipe; i enjoy a bit of mild pummeling, so it's not for me. 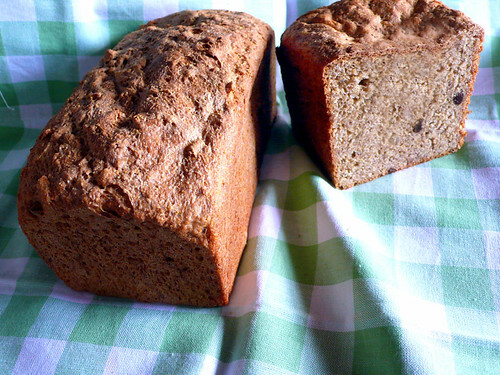 it did get me thinking about bread making again, which i used to do on a fairly regular, fairly obsessive basis. i do bake bread occasionally, but have avoided the simplest, yet trickiest one for me: french-style baguettes. i could make very good ones, but the decade i spent away from regular bread baking has made me lose my touch. practice is all it really takes, but it really does take a lot of practice. imho, the best dough for baguettes is the simplest: hard wheat flour, salt, yeast, water. obvs technique is the key. i still haven't perfected the richard bertinet kneading technique which calls for a wetter dough and a lighter touch, but i'm working on it. one of the things that bertinet recommends if you are a beginning bread baker is that one should try making little rolls or shapes instead of a whole loaf the first time. i was sceptical of this--i thought why not have one big failure instead of a dozen little ones?--but having done it, i concur with mr.b. the dough is easier to work and shape properly, the moisture in the bread dough is wicked away quicker in the smaller masses (which makes for a better crust and overall texture), and it takes less time to cook, for the anxious and excited amongst us. around the same time i read maki's post, i read my cousin's post on a pandesal bakery in the manila 'burbs of marikina. supposedly they make "authentic" pandesal, which, as sassy says, could be the national bread of the philippines if the philippines had such a thing. the name literally translates to "bread of salt" (pan + de + sal), but almost every version i've had has been sweetish, not particularly salty, and frankly a little meh. neither here nor there--either too soft or too hard, too sweet or just bland. 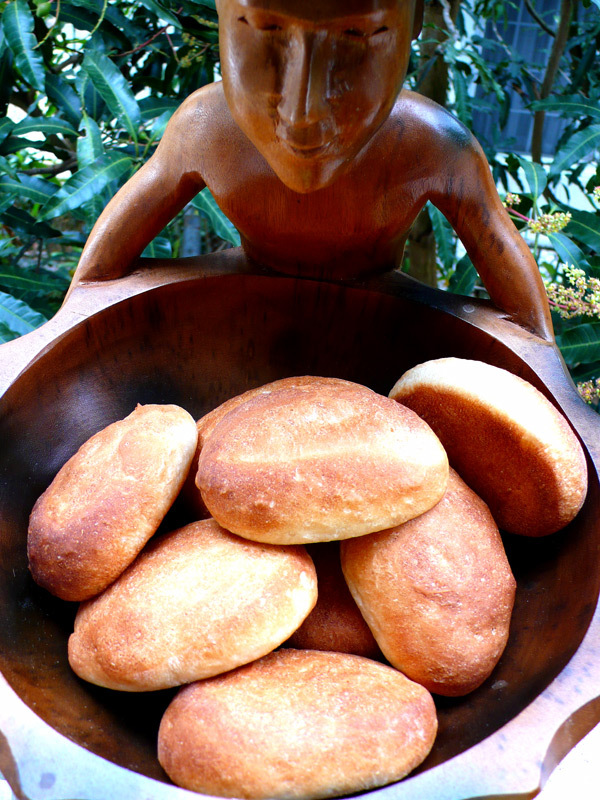 marketman lamented that true pandesal is difficult to find these days; the product of the 'fifties and 'sixties, according to marketman's sister, had a "hard crust, tender airy crumb and...It must have that distinctive crack down the middle." (i imagine that it probably tasted better too.) 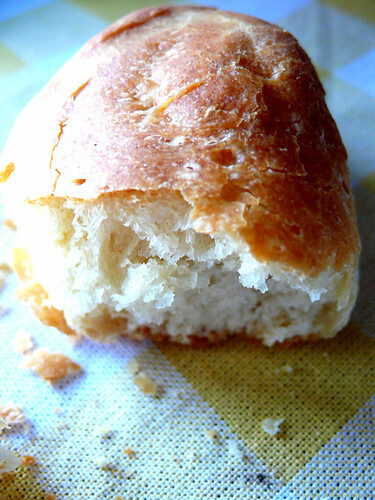 i found a photo of the pan de amerikana version, but it looks much like what can be found elsewhere. not as soft and spongy as commercial varieties have become, but my gut feeling is that it's not what the spanish or portuguese brought over back in the day. wiki saved the day with an excellent pandesal entry on the probable history complete with ingredients, which funnily enough are the basis for a good french baguette: hard wheat flour, water, yeast, salt. hm. so, out came the pans and bowl. 500g of flour, 350g of water, 10ml of yeast, 10ml of salt. first, the yeast was dissolved in 100ml of water and left to bloom for 10 minutes. all ingredients then combined and kneaded to make a soft, elastic dough which should be allowed to double in a warm place. like guam, because it doesn't take an hour to do that. dough punched down, divided in half and formed into logs, which are cut with a sharp knife into equal pieces; each piece is placed cut side up on a baking sheet, and again, left to double. a crispy crust that shatters is easy enough to get with a little steam during baking. the bread bakes in a 475˚F preheated oven--just slide the pans into the hot oven and use a spray gun filled with water to mist the sides of the oven and the tops of the bread with at least 10 squirts. close the oven door, leave for 5 minutes, then mist again. baked for another 15 minutes, the rolls should be golden brown, with a crunchy crust and tender, airy crumb. i don't actually know if this is really like the pandesal of the past so here are some questions for you, if you don't mind. has anyone out there tried traditional pandesal? does this look similar? and is it actually, um, salty in taste? and for the french bread eaters out there, what is it that you look for in a good baguette? bentou/bento/o-bento: boxed meals, usually lunch, as envisioned by the japanese, but not necessarily japanese in itself. 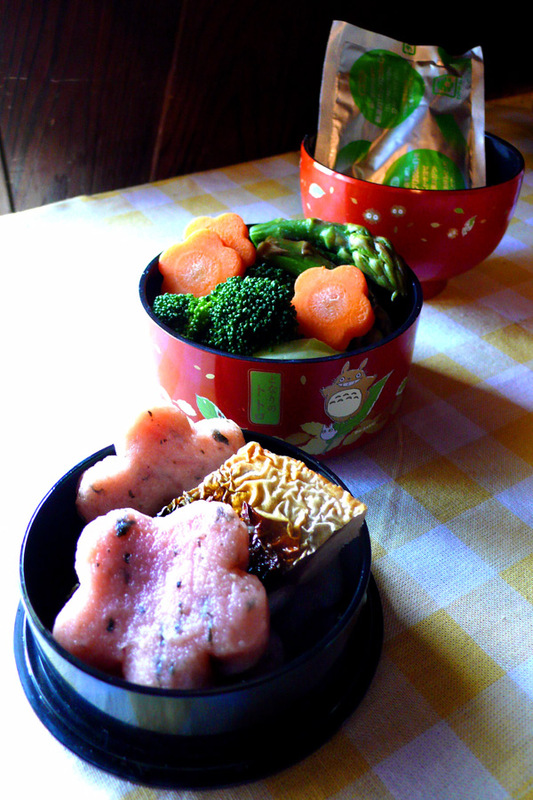 let this great o-bento essay and the bento bloggers explain. i've totally hopped on the bentou bandwagon and here are three reasons why. 1. relatively economical: it's a good way to use up leftovers, and by bringing lunch to work, you save from not eating out. 2. theoretically healthier: because there's a certain amount of aesthetics involved and they are manually assembled, one would hope you'd think about what goes in the box and into your stomach. 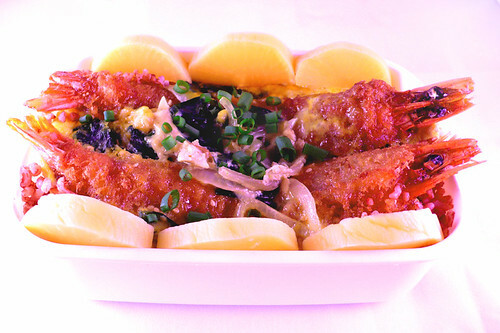 ah, resources: cooking cute, lunch in a box, 毎日のお弁当. yesterday's bentou was ebi-don, breaded prawns in egg, with sautéed onions, green onions, and seaweed, and seasoned with dashi, mirin, soy sauce and a little sugar. this used leftover panko-crusted fried prawns, but make free to use leftover tenpura or beer-battered prawns, or heck, any leftover seafood or plainly cooked meat available. cooked on relatively low heat, the egg takes on a savoury custard quality that is a soothing blanket for the bed of rice it covers. sautée the sliced onion in a small amount of butter and/or cooking oil until just translucent. adjust the temperature of the stove to medium low. combine half the green onion, all the seaweed, dashi, soy sauce, mirin, and sugar with the eggs in a bowl. add the egg mixture to the onions in the pan. as the eggs cook around the edges, push the cooked portion towards the center of the pan. place the prawns in the center of the pan and push into the egg mix gently; continue to move the eggs inward or on top of the prawns. when the eggs have mostly cooked, turn off the heat, and cover the pan with a lid; leave for five minutes. the residual heat will cook the rest of the egg. garnish with the remaining green onion. serve on top of a bed of rice, with pickled daikon radish. as mr. loogy says, you may not have the time for a well-balanced meal in the morning, but a little something is better than nothing. 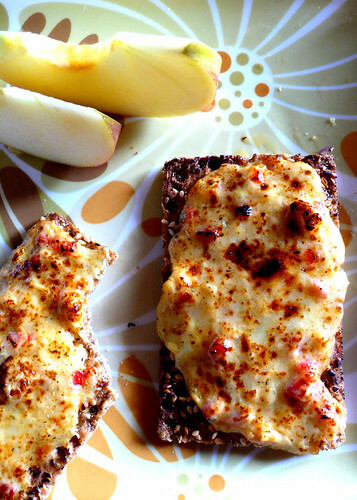 lately i've been craving breads and starches (i blame breadbar), so although these aren't the healthiest breakfasts, they are substantial, relatively economical in time and money to prepare, and oh-so-very tasty. fat tuesday meant pancakes, so i had to have them. 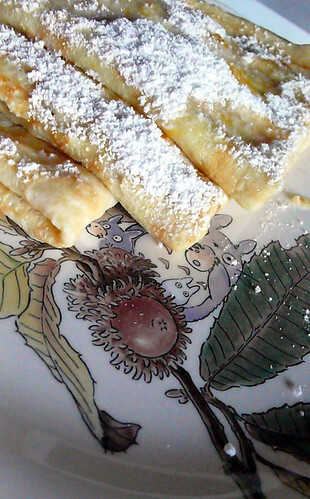 my favourite ones are more like the crepe variety than the flapjack/hotcake one; these were delia smith's basic pancakes with lemon and sugar. i substituted powdered sugar for the caster sugar as a topping, but otherwise a straightforward, simple recreation. 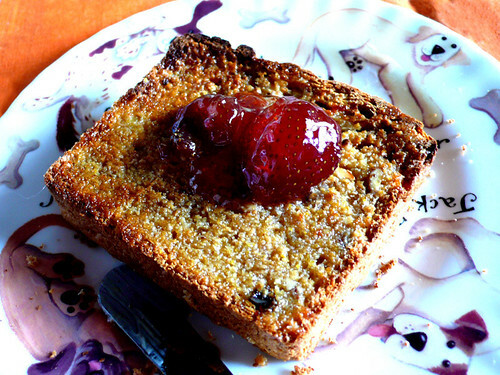 the light sugar and fresh lemon liven up the tender 'cakes, which don't sit heavy in your tummy all day. i don't keep the best stocked fridge (unless you count bath and beauty products), so sometimes creating a meal can be challenging. i had a few odds and ends of various cheeses, including some leftover queso de bola from the holidays, edam, gouda, cheddar and fontina; i took a page out of market manila and grated them all down, added a tiny bit of minced garlic, freshly ground pepper, diced pimientos, and a smidge of mayo to create a zesty cheese pimiento spread. 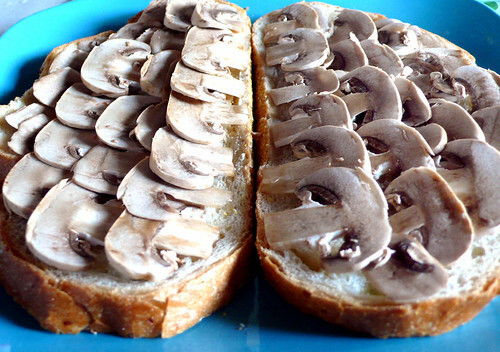 a dollop of this was spread on rye crispbread and run under the broiler until browned and bubbly. sharp yet creamy, spicy yet mellow. crispy, tart apple wedges were the perfect foil for this. 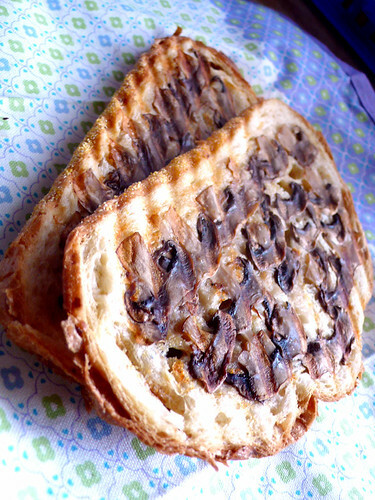 another meal that was borne from economy (and actually, "nancy silverton's sandwich book") has turned out to be a favourite--paper thin slices of white mushrooms arranged carefully on top of thin slices of sourdough wheat bread, drizzled with olive oil, and grilled in a panini press. sprinkled with sea salt and freshly ground pepper, this very simple open-faced sandwich is light in texture, but heavy in fungal flavour (snort). but you know, in a good way. easy peasy, and a nice way to start your day. also, a good way to keep the creepy timer (yes, that's the "real" name of mr. loogy) from coming back to chide you o'er your food habits (although he has some other, helpful suggestions of which you might want to take note).